Mr. Moonwalk has a large selection for a Combo Bouncer Rental for your next party or event! We are proudly located in Macon, Georgia and have a large delivery area. We have some of the coolest combo bouncers around! Mr. Moonwalk's Combo Bouncer Rentals make a perfect addition to parties, events, fundraisers, school events, church events, family reunions, and so much more! Kids of all ages will enjoy the combination of a bounce house with a slide! Some of our selections can help beat the summer heat with water slide combos, like the Blue Ice W/D Combo bouncer. We carry combo bouncers of all shapes and sizes to help accommodate your space. Our Pirate Combo is perfect for more compact spaces. 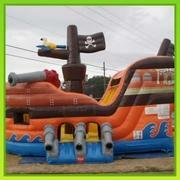 Kids love seeing the giant pirate ship as they enter the bouncing area! So, let them pretend to walk the plank as they bounce, climb, slide and play shoot some hoops on this unit! We also have plenty of combo bouncers for an extravagant princess! With selections like the 5-in-1 Disney Princess Combo and the 5-in-1 Disney Frozen Combo Bouncer any princess will feel like royalty! Little girls will have a blast dressed up as their favorite princess as they bounce, slide, climb, and play with other kids. Parents and spectators are offered a clear view with the 360-degree mesh sides of these bouncers. Do you have all your food planned out? Mr. Moonwalk offers plenty of choices for Concessions andAdd-Ons! Our Popcorn Machine and Cotton Candy Machine are always a big hit and are easy to operate. You guests will enjoy fresh warm snacks made at your party or your event! If you are planning a larger event or party we also offer Event Staff to ensure a steady flow and safety on our inflatables. Contact us today to learn all about extra help and how to reserve all your party rentals!